Please note that the content of this book primarily consists of articles available from Wikipedia or other free sources online. 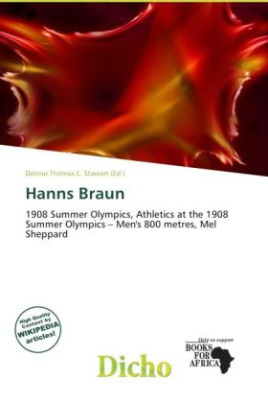 Hanns Braun (October 26, 1886 October 9, 1918) was a German athlete. He was born in Wernfels (today Spalt) and died near Saint-Quentin, Aisne, France as fighter-pilot in an airplane-crash in World War I. He won the bronze medal in the men's 800 metres race at the 1908 Summer Olympics in London with a time of 1:55.2, which was .8 seconds faster than the previous Olympic record but 3 seconds slower than the time of Mel Sheppard, the winner of the race. His semifinal time had been 1:58.0.